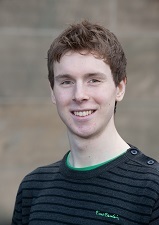 I graduated in June 2011 with a Physics BSc from the University of Glasgow. I was on a gap year during which I spent a bit of time travelling and working. Firstly, I worked for the International Atomic Energy Agency (IAEA) in Vienna, and then I got my first taste of the offshore renewable energy industry while working for an environmental consultancy, called Aquatera, in Orkney. The idea of doing doctoral research with a sponsoring company really attracted me. I don’t think I was that interested in doing a traditional PhD. Also, I thought the way in which the IDCORE programme is structured was appealing. I was happy to spend the first year doing taught modules rather than going straight into the research phase. I was attracted by the opportunity to get involved in a young and exciting industry that is trying to address some of the major global issues. It is also an industry where research is needed in a number of different areas. I am personally quite interested in the methods that developers are using to make their devices more survivable and autonomous. This is something that is incredibly challenging given the fact that these devices tend to operate in some of the harshest environments. For my project, I will be largely responsible for handling and understanding the data that comes off the numerous instruments on Tidal Energy Ltd.’s tidal turbine, known as DeltaStream. This information will then be used to verify and enhance mathematical models of the turbine. The challenge for me will be to design a predictive control system that uses the data from the instruments for load mitigation during high and turbulent flow conditions. Since I work with a company that is on the brink of deploying its first tidal turbine, I hope that during my project I will be able to get quite involved in the device’s testing. Ultimately I hope that my research helps Tidal Energy Ltd. in achieving a number of their milestones over the next few years. The first year of taught modules in Edinburgh prepared me well for my research project. At times it did require quite a lot of hard work and commitment, but many of the skills gained during this period have already proved useful for my research. Now that I am based with Tidal Energy Ltd., the company has made me feel very welcome and I feel more like an employee than a student. Fortunately the work-life balance is healthier now too! Most IDCORE students have had at least one particularly late night in the Edinburgh office to meet a course deadline. My personal best is around 6 a.m., by which time the sun was out. This was just as well because I didn’t have any lights on my bike for the ride home!